Seriously, it's taken seemingly forever for Motorola to bring Android Wear 2.0 over to my Sport 360. As a good Android enthusiast, I jump on any opportunity for an update. I had heard that it was coming soon and checked my phone and no update. So the trick here is to just spam away on the check mark that shows up. I kept hitting it and hitting it... felt like 100x. Until suddenly it shows a screen saying I should charge my watch to download and install. I had a charger at my office but it didn't look like it was doing anything. I finally get home (where I've got WiFi because maybe it needed that for my phone to download it?) and it seems to start going now. Like really slow. I think it took about an hour or so before the download finished. Then it was about 10-15 minutes for the install. It felt like it took forever. What this means is that my watch now has Android Wear 2.0. I hadn't really read a lot up on it. I heard a few things, but I'd rather explore on my own. I have to say, I'm not a fan. 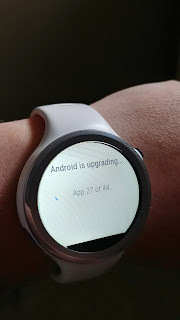 I do like the fact I'm on the 'latest', but the short of it is that it is such a change from the way I worked with my watch in the past that it's going to take some real time before I'm used to it, and there's something that I'll just really miss from the old. 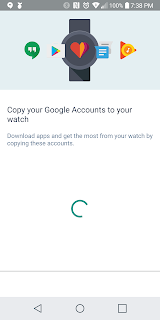 In the set up it asks you to copy your Google Accounts over. Which was weird. 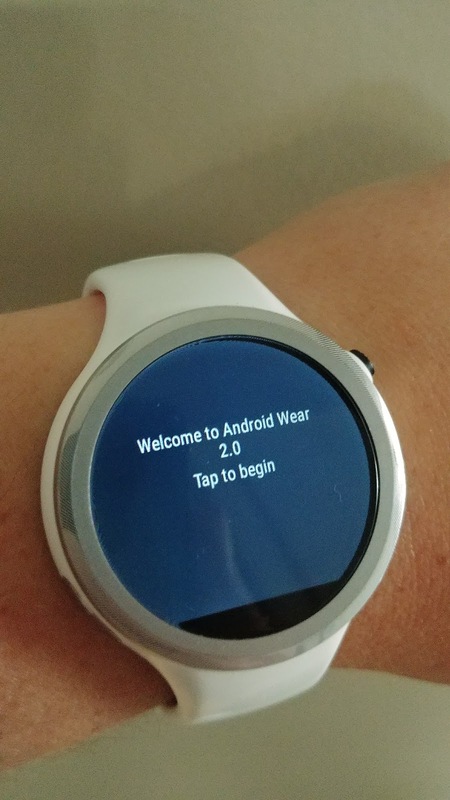 I would have thought the one account that the Wear companion app was all that was necessary. So it took longer to go through all that setup. Okay, but first let me talk about the pros. I do like that I can have a swipe keyboard. I really thought I wouldn't. But the voice recognition tends to be hit and miss and not as reliable (it's about 80% for me, which is good, just annoying when it doesn't work, and usually it's in front of others, so it looks bad). 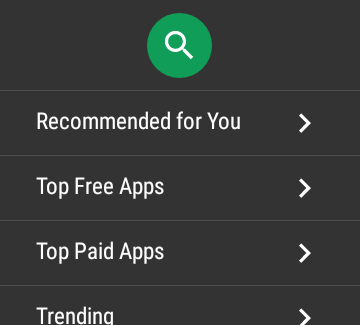 It has the Play Store on the watch, so I can go into the app and install apps separately from the phone. That's pretty neat. 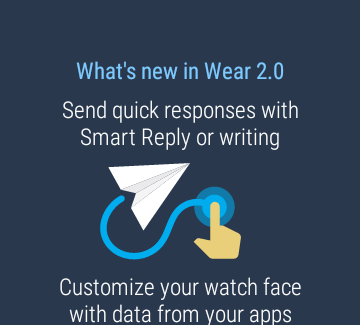 What was weird was there's a setting to see 'complications' (not sure what that is, looks like more recommendations), but to see what apps are on the phone but the Wear app isn't. For me, there was Messenger (Facebook). Would have thought it automatically came over. Anyways, so I can now decide if I want a new calculator or tracking app etc... and not have to go to my phone and install it, have an icon in my drawer when it's just for my watch. Okay, so now let's talk about the cons. Sorry if I'm going to sound nit-picky, but ... I guess I'm pretty particular. Okay, so first up my big complaint is that whenever I turn the watch on, it will be at where I was last time I used it. I'm used to looking at a text message and then looking away, going back to the watch and I'm at the home screen (I have a nice wallpaper which has my weather, and I like seeing the time and weather). So if I want to look at my watch for the time I'll turn it to me and then be met with that text message, so I'll have to hit the button to go back 'home'. I'll just have to remember that when I'm done with a notification to hit the button when I'm done. Seriously, they all look the same. I preferred the cards. They were colour coded, they looked unique... now it just looks like a bland list. So, I'm used to swiping to the right to dismiss, and to the left to interact with the card. Now any swiping dismisses the notification. I've lost a lot of notifications this way (yes, I did do the tutorial; it's just habit). To interact with the card you tap it. And then see what you can do. And this is one of my major issues. I can't edit keep tasks. I can see them, but I can't tick them off... that's one of the ones I use a lot. Especially for shopping lists. I can tick off what I've got in the basket, the wife can add items in and see what I've bought. Now I have to use my phone. Argh. I've given it about 48 hours... waiting to see if cache needed to be cleared, get the setup stuff out of the way, but it's still much slower than I'm used to. And it'll lag on an item here and there. I rarely ever got that before. The other things like how it looks like a small round phone for the icon/app launcher (it looks like it's trying to copy the Gear S3), or how sometimes it feels like it's cutting the screen off where the 3 dot menu, it just takes up a lot of screen real estate. Or the settings, trying to find Bluetooth so I can pair new headphones is a little more hidden, and going through my 'favourite contacts' option for quick actions (having to go to the contacts app is way slower) ... everything is 'different' from my previous workflow. I'll adjust, but I'm really hoping they have a good look at 2.0 and see what they did to make it not as usable as the earlier version and what made the earlier versions easy to use.